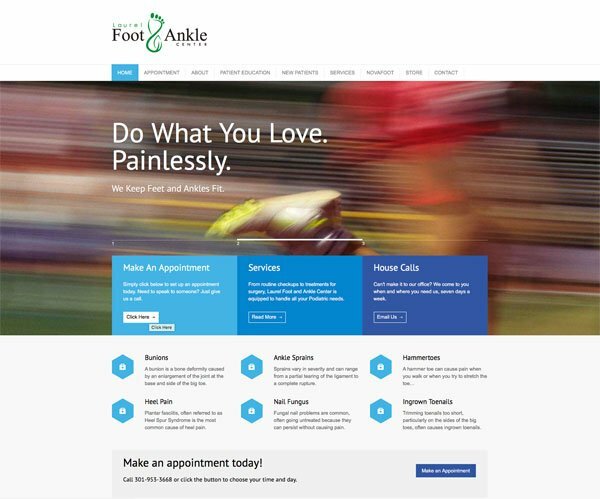 Diana Ries Designs, Inc. Laurel Foot & Ankle Center in Maryland Gets a Make-Over - Diana Ries Designs, Inc. Turns out the owner of the Charter company is a foot doctor. Imagine that… AND he's a pilot. Michael Klein, Podiatrist and part-time charter pilot was thrilled with the work we did on www.flyopenair.com. That's because the charter business is handled by their GM. So, one day I get a call from Dr. Klein, "We'd like you to look at our foot doctor sites. Can you redo them both?" Not only did we redo Laurelfootandanklecenter.com and the sister site Novafoot.com…We redesigned both logos. Creating a cohesive, congruent pair of sites that worked together seamlessly. Making their extensive knowledge and expertise accessible.